It’s time…after a two-month hiatus, Doctor Who is back for the final six episodes of its sixth series, and my reviews for new episodes are resuming as well! If you haven’t read one of my TV Reviews before, here’s how it goes: I write about new episodes the night they air, with posts going up an hour or two after the end of the episode. Though I call these posts ‘reviews,’ they are mostly analysis, looking at the meaning of the story, making predictions for the future, etc. If you’d like to read my past Doctor Who reviews from my YourHub days, I’ve re-posted them all here on the blog. Also, if you’re visiting this blog after reading my YourHub work, I want to make note of one significant change to my TV Reviews – starting with tonight’s review, I will no longer be assigning letter grades to TV shows; especially with shows like Doctor Who, where I feel quality is largely consistent week-to-week, it seems like a fruitless practice. But enough of that…Spoilers for “Let’s Kill Hitler” after the jump! Well then…that was fun, wasn’t it? In one episode, we get crop-circle temporal messages, a new best friend for Amy and Rory who turns out to be the second incarnation of their daughter, the birth of the third and more familiar incarnation (aka River Song), some Nazis, Hitler, bike chases in the streets of Berlin, a miniaturized space/time-ship intent on wiping out history’s greatest war-criminals, holographic appearances of past companions, another dead Doctor, a giant moral dilemma for young River, Matt Smith in a really smashing Tuxedo, and a sonic-screwdriver-cane. Whew. Each of those could easily have been the basis for one single Doctor Who adventure (well, maybe not Matt Smith in a tuxedo, but you could probably expand that to the Doctor attending a fancy interstellar dinner party or something and fashion a fairly enjoyable script out of it), yet in true Steven Moffat fashion, it’s all here in one sweeping epic of an episode. From start to finish, “Let’s Kill Hitler” wages such a relentless assault on our minds and senses that it takes a few minutes of post-viewing downtime just to work out what all happened, let alone form a coherent opinion on the episode. On the whole, I think it was quite fun; it’s easy to imagine this story expanded to two-parts – given all that’s going on, I don’t think it would hurt the pacing one bit – but at the same time, part of the fun comes from having so much story wound so tightly together, and if you’re looking for sheer visceral response, the hour gives the viewer the same breathless, drained feeling poor Amy and Rory must have being in the middle of all this chaos. I don’t know how Moffat possibly kept his sanity writing this thing, but it all comes out very clearly, and the more I ponder the episode, the more I love it. Like many of the best Doctor Who episodes, “Let’s Kill Hitler” blatantly demands repeat viewings, and I’m sure it will be even better on a second-or-third go round. But before we get into the fun stuff, I do want to lodge one complaint: we were led to believe that Moffat had some brilliant creative reason for splitting this sixth season up into two halves, and thus leaving us hanging for two months in the middle. “A Good Man Goes to War” certainly felt like a finale, especially because it ends with the Doctor flying off into space to find Amy and Rory’s daughter, Melody. I thought for sure the real-time gap between episodes would be used to conveniently leapfrog whatever progress the Doctor makes in that quest which, given his confidence in the final moments of “War,” was implied to be quite a lot. Instead, we come back, the Doctor hasn’t discovered anything, and a disappointed Amy points out “You’ve had all summer.” Indeed. He has. And nothing happened. We literally pick up right where we left off, giving us no creative justification for a two-part season or the massive, hype-building cliffhanger of “War.” To me, that just feels sloppy – couldn’t the Doctor have discovered something during his time away? Why did he act so confident in “War,” proclaiming that he knew “exactly” where to find Melody? Maybe we’ll learn more about that gap later on, but for now, I’m not entirely sure what narrative purpose slicing the season down the middle served. Then again, maybe it was just a practical decision. It would, after all, be a lot harder to get away with an hour as crazy as “Let’s Kill Hitler” in the middle of the season; positioned as a “premiere,” though, something this zany and complex is absolutely welcome. Let’s begin by taking a look at my favorite parts of the episode – anything involving Alex Kingston. After watching “Let’s Kill Hitler,” we no longer have to imagine – we’ve seen the meeting River was referring to, and we know exactly what the encounter did to the girl. 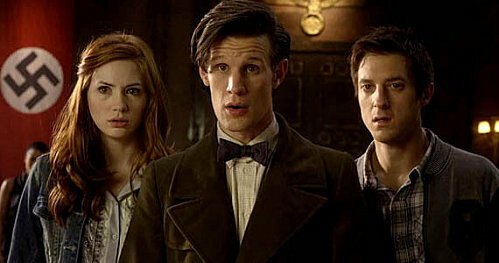 We don’t know River’s exact age in “Let’s Kill Hitler,” (though I assume she’s been around somewhere between thirty and forty years: let’s say the little girl is ten, she regenerates, then grows up with Amy and Rory, who are in their mid-twenties, making thirty-five a good estimate), but since she’s just regenerated into the form she still holds when she later speaks of the episode to Rory (later for her, earlier for the audience), I think it makes sense she would refer to herself as “young.” Not just that, but the River of “Let’s Kill Hitler” is barely recognizable as the character we know and love, and not only because she spends the first portion of the episode in a different body. The introduction of ‘Mels’ felt a little forced at first – look, it’s the best friend we’ve never heard of before! – but that’s easy to forgive considering it gave us a look into Amy and Rory’s childhoods, (complete with another appearance by the young and extremely talented Caitlin Blackwood as little Amelia), many hilariously cruel jokes at little-Rory’s expense, and the revelation that Amy and Rory became romantically involved only after Rory learned Amy thought he was gay for entire lives. That’s certainly one of the cleverest, funniest, and sweetest sequences in all of modern Doctor Who. It was also a satisfactory introduction to Mels, whose violent anarchist streak indicated she was actually a prior regeneration of River right off the bat. The River we know isn’t really vicious, but she is defined by a darkly playful personality; Mels’ gun-toting antics were a natural extension of that, so it didn’t come as much of a surprise when she regenerated. That didn’t lessen the impact of the moment, mind you: seeing the birth of Alex-Kingston-River is indeed a very special event, and Kingston was fantastic in her post-regeneration zaniness. That’s a scene typically reserved for actors playing the Doctor, and in addition to throwing out some nice references to David Tennant’s and Matt Smith’s first scenes with the series, she also added her own unique touch to regeneration. In fact, Kingston was utterly mesmerizing throughout, playing a far darker version of River Song than we’ve ever seen before. That brings me back to my earlier point, that while this person may look like the River we’re familiar with, she’s an entirely different being. This River has never met the Doctor, but she’s spent her whole life hearing about him, first from the people who kidnapped and brainwashed her, then by a young Amelia Pond as, in the guise of Mels, she grew up alongside her own mother and father (work that one out, Freud). But where Amelia grew up infatuated with our titular time lord, River’s upbringing has made her a psychopathic killer intent on one thing and one thing alone: killing the Doctor. After a wonderfully fun war of wits between her and the Doctor, culminating in River brandishing a banana like a firearm, she succeeds in doing just that, giving the Doctor only thirty-two minutes to live. This leads us to another highlight moment where the Doctor retreats into the TARDIS to run diagnostics on himself. His projection switches between all of his former companions, all of which conjure such strong feelings of guilt inside the Doctor that he can’t bear to look at them. When he reaches Amelia, however, he doesn’t feel so guilty; he may have let down his other companions, but he still has time to do right by her. Thus, the Doctor decides to stop worrying about himself and instead achieve one more thing in his final thirty-two minutes: salvage the soul of Amy’s brainwashed daughter. This is where the brilliance of “Let’s Kill Hitler” shines brightest, as the Doctor unleashes his knowledge of the woman Melody will become unto the young and violent being she is now, saving her from the ‘justice department’ in the miniaturized space-ship (the “Telesecta”) so that she can grow up and redeem herself. This is the Doctor at his most selfless, and his total determination to save one person in his final minutes of life echoes one of the greatest Doctor Who stories ever, the Peter Davison serial “Caves of Androzani.” There’s an added layer of depth in “Hitler,” however; in Androzani, the fifth Doctor was focused on saving his innocent new companion, Peri, whereas here, our eleventh Doctor is fighting for the life of his own killer. I think it goes without saying at this point that Matt Smith is an acting God, but damn was he good in illustrating the Doctor’s determination, selflessness, and age in the episode’s back-half (he was also ridiculously funny throughout). That selflessness, and the Doctor’s total trust in this mysterious ‘River Song,’ also made an impression on Melody. When River asks Rory to “imagine what that does to a girl,” I think she’s specifically mentioning the moment when the Doctor has saved her, is dying on the ground, and asks to give Melody, his killer, his last words, rather than Amy or Rory. We don’t know what the Doctor told Melody, but I think the simple fact that he said anything in those final moments spoke volumes to her. “Imagine what that does to a girl.” It changes her, for the better and forever; in that moment, the Doctor has undone whatever brainwashing Melody endured, and Melody decides that, instead of being the Doctor’s killer, she’d much rather be his savior, and sacrifices all remaining regenerations to revive him. It’s funny – when “A Good Man Goes to War” aired, my friend Sean Chapman (co-host on The Monthly Ten Podcast and Doctor Who aficionado) said he was a bit disappointed with the revelation of River Song’s identity, saying it didn’t tie in heavily enough to the Doctor’s story. I didn’t necessarily agree, but given how much we’ve heard about ‘River and the Doctor,’ the complaint made sense. Yet after “Let’s Kill Hitler,” I think we can put Sean’s complaint to bed, since the episode makes it clear that River’s entire existence has been irrevocably connected to the Doctor. She was raised trying to kill him, and the turning point in her life – the moment when she really starts to become “River Song” – is when the Doctor falls out of the sky, takes her to Germany, and changes her entire outlook on life with his selfless actions. That’s what River meant when she asked Rory to imagine what meeting the Doctor does to a girl. We no longer have to imagine – as we’ve now seen, thanks to her first meeting with him, River has been, and always shall be, defined by the Doctor. One of the bigger conundrums we’re left with at the end of “Let’s Kill Hitler” is the nature of the Doctor’s future-death, as seen in the season premiere. We know that the little girl in the suit is River (or, at least, we logically assume so), but if River already killed the Doctor at a young age, then why did she have to do it again two regenerations later? The answer, I think is apparent on the Doctor’s face at the end of the episode as he reads about his future death on the TARDIS screen: Time can be rewritten. Though the Doctor did succeed in his goal of giving River a second chance, that came at a huge cost. Not only was River robbed of all future regenerations, but she also had to spend her first few decades of life as a psychopathic killer, and as for Amy and Rory, they never got to raise their own daughter. I don’t think any of that sits particularly well with the Doctor, which is why, when he sees the report of his own death in Utah, he looks happy, rather than frightened. River can’t turn her life around until the Doctor is dead, such was the totality of the Doctor’s defeat in a “A Good Man Goes to War,” but if Melody Pond were allowed to achieve her goal earlier, rather than later, she could have a long, happy life ahead of her. What if, then, the Doctor engineered everything we saw in the season premiere? What if he allowed the Silence to track him to the lake and bring their secret weapon – young Melody – with them, thus sacrificing himself before things can spiral out of control? That would seemingly create a paradox, since older River is there too, watching the Doctor get murdered alongside Amy and Rory. But that paradox might fill in some blanks about River, who clearly doesn’t remember the astronaut suit or the Silence’s underground lair in the premiere, even though that was her home in her first phase of life. If time were that drastically rewritten, who knows what would happen? The big unanswered mystery coming out of season five was ‘what caused the TARDIS explosion?’ The explosion was at the center of that season’s story-arc, accompanied by the phrase “Silence Will Fall.” It’s been clear since the Silence were introduced in this year’s premiere that we’re well on our way to solving this conundrum, and “Let’s Kill Hitler” took another step in that direction by confirming that the Silence were behind Melody’s kidnapping and brainwashing. I suspected that Madame Kovarian (also known as “Eye-Patch Lady”), Melody’s kidnapper, was working for the Silence, but it’s nice to have confirmation, and finally gives us a link between the Doctor and the organization hunting him down. We also learned (all courtesy of the Teselecta memory banks) that the Silence aren’t a species, but a “religious order” centered around the saying “silence will fall when the question is asked.” The question, naturally, is unknown, which has to be a nod to the question of ‘life, the universe, and everything’ at the heart of Douglas Adams’ Hitchhiker’s Guide to the Galaxy series (Adams also served as a script editor on the classic Doctor Who series). What could the question be, I wonder? We were told it’s the oldest question in the universe; couple that with the Silence’s mad desire to assassinate the Doctor, I assume the question centers around the mad man in the big blue box. Does the question drive the Silence’s desire to kill the Doctor, or are they just pissed off because the Doctor drove them off Earth? If the Silence do manage to kill the Doctor, will the TARDIS die alongside him, creating the explosion from last season? Lots of good questions, and only five episodes left. I can’t wait. As with most Moffat episodes, any discussion of “Let’s Kill Hitler” could conceivably last for another ten pages, so I’ll cut this short in the interest of our collective eye-strain. This was another masterful episode from a writer who doesn’t seem physically capable of writing anything underwhelming, and in terms of getting the audience pumped after a few months off, I don’t think we could have asked for a better premiere. It was funny, exciting, confusing, and awe-inspiring – in other words, classic Doctor Who through and through. --I think it speaks to the sheer volume of story contained in this episode that I’ve hit 2700 words without a mention of the Teselecta, the organization travelling through time in a shrunken-ship to kill war criminals. For the purposes of the episode they were a rather fantastic plot device, but I also think the thematic message Moffat was getting at, about the morality of killing war criminals, got lost in the shuffle. --Rory was a bit of a badass in this episode, first punching Adolf Hitler, then knocking out a Nazi guard and stealing his motorbike. Go Rory! --As River examines her new face in the mirror, she says “I might take the age down gradually, just to freak people out,” a reference to how, given humans age, Alex Kingston looks younger in her first appearance than she does now, when River should look her oldest at that point in the timeline. --Could BBC America possibly pick any worse spots to place commercials? It really ruins the flow of the episode when commercials are thrust in mid-scene, and considering tonight’s hour had limited breaks, I would think they could have fixed the problem. I buy iTunes season passes for this show so I can watch the episodes again, unedited and in HD. The prices are surprisingly fair by iTunes standards, and you get lots of neat extras, so I recommend checking it out if BBC America is getting on your nerves.